The only way is up for Wigan Athletic as far as Anthony Pilkington is concerned! 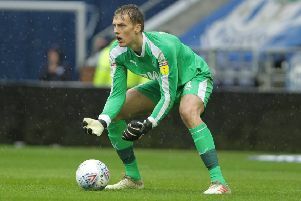 And the January signing from Premier League outfit Cardiff City believes Latics should be less concerned with what’s happening below them in the Championship table - and more interested in the teams within touching distance just above. “I don’t think there’s any need to be looking down in the table,” said Pilkington, whose side are seven points ahead of the bottom three after Saturday’s 2-1 victory over QPR, ahead of this weekend’s trip to struggling Rotherham. “We should be looking up with the quality we have in the squad. “The win over QPR should give us a bit of confidence to take into Rotherham. Pilkington was one of three new-boys to impress against QPR, with Leon Clarke grabbing a goal and an assist for the victors, who were skippered by Danny Fox on debut. And Pilkington says the duo are exactly what Latics need at this stage of the campaign ahead of the all-important run-in. “They’re quality players, experienced players, and they’ve come in and immediately lifted the place,” he added. “You can tell they’ve played plenty of games at this level and higher, and it’s exactly what we’ve needed. “They’ve added even more competition for places, and that’s what you’re looking for as a squad.